Brandalley Discount Code 2019: BrandAlley is a UK based online retailer which offers fashion, home and beauty products. It is the most desired name among those who love latest fashion and style. There are over top 500 brands available at BrandAlley UK. 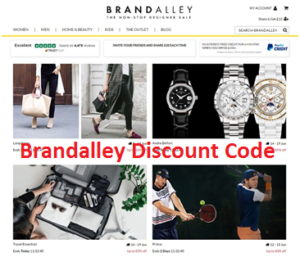 Here we will check Brandalley voucher code 2019 and their returns policy. You can buy top brand clothes for men, women and kids at unbelievable price online at www.brandalley.co.uk. It is fun to buy BrandAlley items online; the items are organized in well defined category and detailed information is provided about all the products. You are also provided size guide and other necessary guidelines. BrandAlley is a member-only site and offers great discounts. It delivers products fast and usually delivery of the order takes place within 2-4 business days. You can get up to 80% discount on various products. Everyday new sales come up with several designer products; you get all the items at unbelievable price. There several different ways to get Brand Alley voucher code or discount code 2018. You can refer the Brand Alley site to a friend and when she/he makes first purchase, you get a voucher code through email. Brand Alley voucher code can save you considerably. You have to apply the voucher code when proceed for making payment. When you join BrandAlley as a member, you will get a voucher code which will offer you £10 off on your first purchase. You also get BrandAlley voucher code from third party website many a times. Usually you get a voucher code for £10 off for purchases made during specific time or on certain products. You can look for voucher code online and save considerable amount of money. Sometimes you get promotional voucher code, say you make purchase of certain amount and you are offered discount code for your next purchase. If you are not satisfied with the items you have purchased from BrandAlley, you can return the product within 14 days from the date of delivery. The item must be unwashed, unworn and undamaged. It must be packed in original packaging. Your original package contains return form and you have to follow the instructions written in the return form. You have to bear the cost of returning the product. If you use BrandAlley’s return mail services, £3.50 is deducted from refund. The refund for the item returned is given in the original mode of payment.